You can load your picture in Mail, and your email recipients will see your picture next to the From field. To do this, open the menu Settings → Personal data, signature, picture and click the Change picture button in the My profile picture section. If you do not have a suitable image, you can take a picture using your webcam by clicking the appropriate button. Attention. It can take several days to change the profile picture in the list of emails. If you haven't uploaded a profile picture in Mail, your emails can show your avatar from a social network profile that supports the ability to search for images and user profiles by email address (such as Facebook). To change the picture, remove the old image and upload a new one. A Delete link is available under the picture. Note. The profile picture is only guaranteed to be displayed in Yandex.Mail. If your message recipient uses a different mail service, it may not support this feature and the recipient will not see your picture in the message header. If the picture is not displayed on the Sender information page, you just need to wait a little. The system requires some time to load new information about the user. If the portrait does not appear after a week, try to clear the browser cache. If a picture of somebody else is displayed instead of your picture, it is possible that someone has provided your email address as a contact in the social network settings, and our system has linked this account to your mail when collecting open data from social networks. Contact the support service of this social network with a request to remove your email address from the profile of that person. To contact the Odnoklassniki social network support service, follow the link http://www.odnoklassniki.ru/dk? st.cmd=helpContent , then click Contact support service at the bottom of the web page and fill in the form. To contact Facebook support service, follow the link http://www.facebook.com/help/contact/?id=274459462613911 and fill in the form. 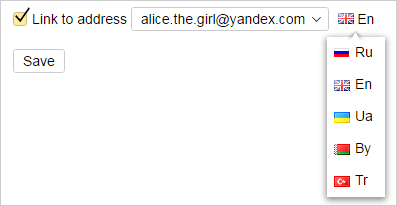 If the wrong picture is still there after a week, contact Yandex.Mail Support using the form at the bottom of the page. Sometimes the social network Odnoklassniki gives search engines data on profiles that were closed or deleted. To delete this picture from your mailbox, contact Yandex.Mail Support through the feedback form at the bottom of the page. 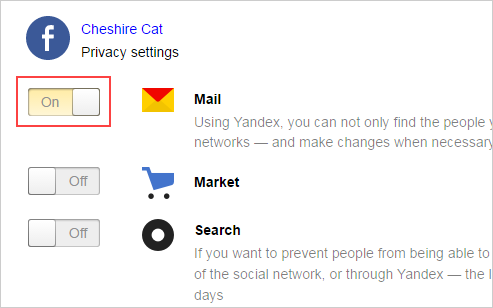 The standard methods won't work to set a picture for your Yandex.Mail for Domain, but you can set it on your Passport page.